Why SoundCloud ? SoundCloud is very easy and simple to use It is free (at least the basic version which is all we need to use with students). SoundCloud enhances and adds another layer for students communication with teachers. Sometimes telling is more expressive than writing or visualizing and SoundCloud is ideal for that. SoundCloud gives a voice to students and enables them to say their minds. SoundCloud improves students engagement with the learning taking place in class through the interactive features it provides such as commenting and liking. Adding audio in your instruction diversifies your teaching methodology in such a way that it meets the needs of the different learning styles in class. SoundCloud is available both on the web and as a mobile app for iPad, iPhone, and Android. Ways to use SoundCloud in Class Students can use it for language practice. Students record their speaking and teachers provide comments on their performances focusing on particular language areas like grammar, word choice, language slips…etc Students can use it to enhance their speaking abilities by recording speeches addressed to their peers or to other classes. Students can record audio clips and add them as explanatory materials to the class projects they are working on. Teachers can use it to add audio feedback to students assignments. Teachers can create a SoundCloud group for their classes and encourage students to upload, record and share audio there. The group can be set to private so that only students can view and use it. Encourage students to leave comments on the sound tracks uploaded by other students in the SoundCloud group of the class. SoundCloud can be used for digital storytelling. Students can use it for book reports. They can record audio book reports outlining their thought. about the books they read and invite others to interact with the audio by leaving comments. Use SoundCloud to document and distribute lessons and lectures with students. Use it for podcasting in class. Recording and Uploading to SoundCloud SoundCloud allows you to either upload an already recorded audio clip from your computer or to use its recording application on site to record a new sound track. Keep in mind that a free account allows only for 120 minutes. If you want more you have to go pro. But one way to save thee minutes it to ask students to download audio tracks you have already worked on so that you free some space for new ones. To start recording your clip, click the "Upload" button in the top, right hand corner of your Stream . When you're happy with your recording, click "Upload your recording". While your sound is posting, you can enter its details, decide whether you want it to be public or private, and set permissions for downloads, embedded players, and apps. Once the sound is fully posted and transcoded, remember to hit "Save" at the bottom of the page. Adding comments to audio clips This is one of the powerful features in SoundCloud. Teachers can use this feature to add feedback on students sound tracks. Alternatively, students can use it to leave feedback to each others. There are two ways to add a comment to a recording. You can either add a comment to the recording in general or you can add a comment to a specific part in the recording. To do this just drag your profile icon to the spot where you want to add your comment along the audio timeline and type it in. Set up a group for your class on SoundCloud Setting up a group for your class will allow you to share audio files with the whole group. Students can then add comments and interact with what you share or what their peers share in the class group. Here is how to create a group for your class. Click on " groups" from the menu as shown below then click on " create a new group"
Provide a name for your group together with a few words describing it. You can also Upload an image to use with it, supported formats include: jpg, png, gif, tiff up to 2 MB. Once the group is set up, you can then share it with students and invite them join it. SoundCloud for Education SoundCloud can help facilitate education in a number of ways whether you want to record or just distribute your audio. Before You Start Whether you want to distribute recordings of lectures, facilitate a way to receive audio amongst students or even communicate between student and teacher, SoundCloud can help. For example you can upload lectures to SoundCloud and push them to the relevant social networks, embed on sites and also submit to iTunes. With our record capability via the site you can even document lessons easily or even use it as a way to communicate. Distribute Lessons and Lectures Documenting lessons is a great way to both archive information and remove barriers for learning whether someone misses a class or is on the other side of the globe. Take University College London. 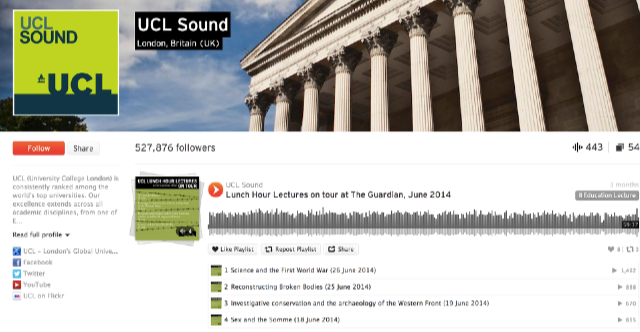 They use SoundCloud to both communicate to students the latest news on UCL, and document and distribute their public lectures. They then embed that on their site and also distribute it via their social networks - predominantly Facebook and Twitter. TinyVox is what everyone is talking about. I would certainly make a subdomain and point it to a metanotes space... maybe even my home page!!! it would have to redirect to a specific space, not just to an account. so unamerican.com could point to user/sri/unamerican and have that URL cloaked and it shows up like unamerican.com and tangents down from there like and so. Worth paying for to me, it sounds like. Twitter sharing = not so hot? as readers' digital attention scatters to Snapchat, Twitter, Instagram, and Facebook, publishers will acknowledge that their websites are anachronisms. It's hard to say that this is happening today. Most major websites are seeing growing traffic. But there are only so many hours one can look at a screen in a day. More of those hours are going to mobile devices. A growing share of those hours (and their corresponding dollars) are going to communications apps, like Twitter. And, by my calculations here, Twitter is sending less than 2 percent of its overall engagement back to the web. Apps don't pay my rent. A website does.